Over the last month or so I’ve been traveling non-stop all over Japan, and have had to take luggage of varying size with me wherever I go. On planes, trains, and automobiles, hefting them up and down stairs, trying to maneuver a two-wheeled, one-direction-rolling carry-on bag through a crowd of people with grace and dignity, which very rarely happens. Needless to say, I figured out what aspects of my luggage could be improved upon. One of the biggest challenges was obviously dealing with stairs. Elevators are sometimes non-existent, or so far out of the way that it’s a drain on time, and your back normally deals with the aftermath. The people who created TraxPack must have been at the end of their rope with this issue too, as they’ve created a solution. 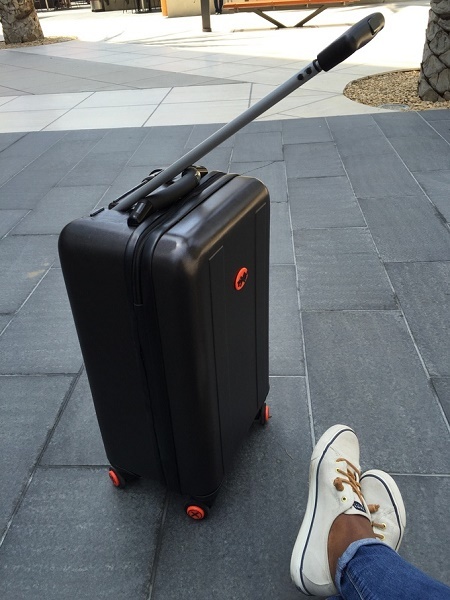 This luggage has the convenient 180 degree-turning four wheels that let you move around easily, have a handle that bends forward and back, and treads on the back that let it go up stairs like a tank. This system is easy enough to use that even kids can lug their suitcases up and down stairs, with the weight of the pull being their only obstacle. Of course, it wouldn’t feel like it was worth $278 if it didn’t have a built-in luggage scale, phone charger, and proximity sensor. It’s already worth the price tag for what it would save in back pain for busy travelers, but those elements sweeten the deal.